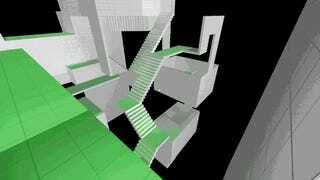 The basic idea is a straightforward puzzle game, built in an open world that you can navigate as you unlock portals to different areas. Many of the puzzles are already built, and some of them really mess with your head. Despite how the puzzles may have frustrated me, the mechanic itself feels surprisingly natural, thanks to the color-coded gravity fields.